Indian Ocean is a logistically challenging place for large scale ship observation despite its large amplitude variability with intraseasonal to decadal time scales owing to the complicated wind system and topography. After IIOE-1, World Ocean Circulation Experiment (WOCE) established a number of hydrographic sections to monitor this important ocean. As JAMSTEC contribution towards the Global Ocean Ship-based Hydrographic Investigation Program (GO-SHIP), decadal reoccupation of the WOCE section I8N (nominally along 80�E, 6�N to 24�S, previously occupied in 1995) and new occupation of the section I7S (nominally along 57.5�E, 28�S to ice edge) are proposed. All GO-SHIP level 1 and some level 2 water samples will be collected from the surface to near the bottom along with continuous CTD observation. 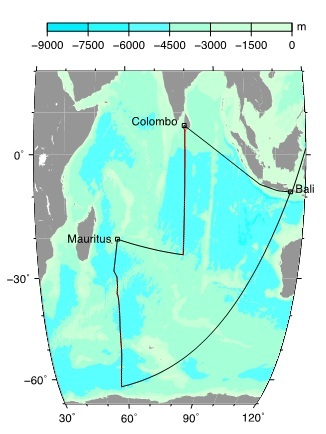 In addition to providing baseline hydrographic data to describe the ocean circulation in this relatively unknown part of the Indian Ocean, the data will contribute to clarify subsurface decadal changes in water properties associated with climate change and to improve the carbon budget by measuring the subsurface carbon distribution in this mode/intermediate water source region. Other items including ocean-atmosphere fluxes and biogeochemical parameters will also be measured.